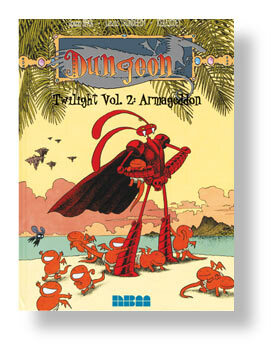 IT’S DUNGEON MONTH AT NBM! And in The End of Dungeon the more the islets of the planet Terra Amata move upward, the less there is of breathable oxygen. While Marvin the Red and Zakutu, daughter of the Grand Khân, attempt to protect the seven objects of Destiny, Herbert and the Dust King are forced to swear allegiance to the Black Entity in order to gain access to breathable air. We are witness to the very end of Dungeon! 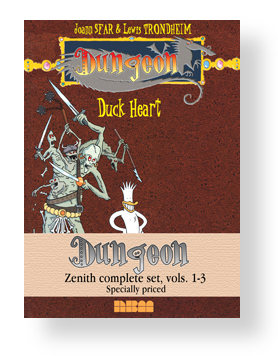 Two stories continue the heyday of Dungeon, in the first, Isis is to be married to the Keeper but she wants Herbert! Besides, the whole affair promises to ruin the Dungeon completely. In the second, besides the continued Keeper financial mishaps, Herbert wishes to make his comeback to his hometown where his name is mud. He disguises himself with a potion that makes him ‘the mask of death’. Only one problem: if he laughs, he becomes himself again! 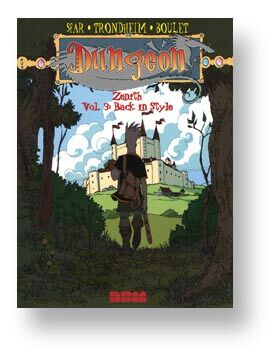 We start on another tangent of the vast world of Dungeon, one that relates the origins of it. In this first story of the Early Years, you will see the Keeper barely an adult and leaving his family to go find fortune in a time of chaos and darkness… Blain (Isaac the Pirate) illustrates on a story by Trondheim and Sfar. 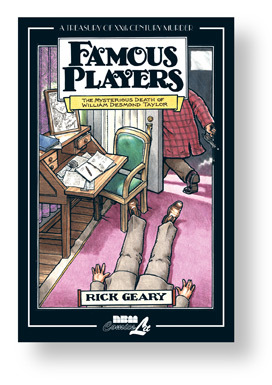 Fun, adventure, suspense and… wry satire. The first 3 books in this part of the great saga in one specially priced set. The planet Terra Amata, on which Dungeon resides, has stopped turning. On one side, total darkness and absolute coldness; on the other, a searing desert and eternal day. The survivors live on a thin slice of earth where day and night meet. A territory known as TWILIGHT. Welcome to the third facet of the Dungeon world, its dark downfall. Marvin is blind but still dangerous and Herbert the Duck has become the darkest of Lords. 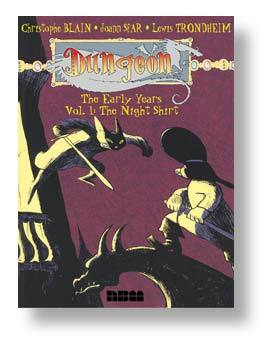 A darkly funny satire of fantasy that brings together the first two volumes of the Early Years, this collection relates the origins of the vast world of Dungeon. 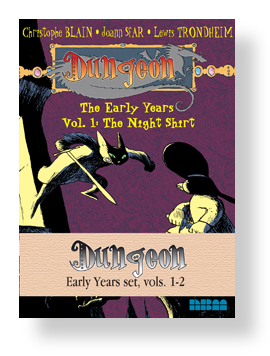 In this first story of the Early Years, the Keeper leaves his family to go find fortune in a time of chaos and darkness and becomes the Night Shirt—a misguided vigilante who renders justice nightly. In the second story, the Night Shirt stumbles upon Alexandra, the one he pines for, about to be raped and comes to her valiant and heroic rescue with romantic bravura. 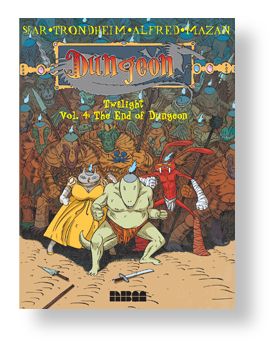 Perfect for lovers of heroic fantasy and dark humor, this two-volume set is the complete run of this subseries of Dungeon. SPECIAL PRICE! Specially priced set! Collecting the main core introductory storyline to the popular sprawling dark-humored epic spoofing horror and heroic fantasy. 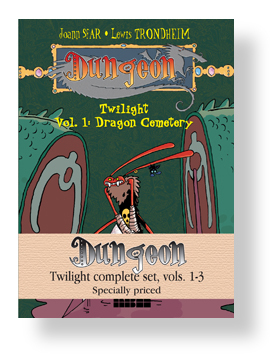 Includes volumes newly back to press! SPECIALLY PRICED! By the artist of the recently released Invincible Days. Celebrates India’s tradition of elevating romance to a work of art. Atangan adapts Rajput polyptych paintings of northern India and transforms them into a unique and poetic comic experience. 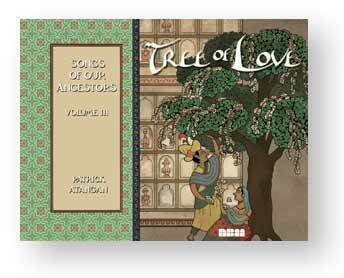 Tree of Love follows a prince’s courtship of a flower peddler. The young prince is surprised by the difficulty in proving the worthiness of what everyone sees as a common woman. But she has a secret, a special gift bound in the beauty and power of nature. Each page faithfully ornaments Tree of Love’s painfully universal story about the intricacies of love. So says Library Journal of Why I Killed Peter about the author’s experience with abuse at the hands of an otherwise cool priest. This only adds to the great press this book had gotten, including The Onion, a starred review from Publishers Weekly, the Miami Herald and many prominent websites. It should be noted there is little in this book that could prove visually offensive. If you haven’t checked this out yet, it’s a very sensitive rendering of a fairly shocking experience. “The work is gorgeous, due to the artist’s skill, observations, and especially watercolors.